One of the nice parts about travelling is catching up with old friends along the way. Even though many years separate visits, our countries being a day away by air, conversation resumes from where we left off, as if the intervening years are a mere second in time. This was certainly the case when we stayed with our old friend Paul Merry and his partner, who live in a small village near Shaftesbury, Dorset. It was a pleasure to find them unchanged and well, but also especially wonderful that he had done a large bread bake the day before and had a few spare loaves. At last, some good bread, though good is hardly an apt word for his long fermented sourdough made from stoneground organic flour. Paul Merry is the doyen of artisan bread making in these parts. I don’t need to preach to you, dear reader, about the sad and sorry state of modern commercial bread, that awful product so nutritionally empty and bland, that chemicals need to be added to make it edible. You can either eat it or you can’t. I can’t. It makes me ill. So during my travels, I mostly go without bread, with only an occasional and regrettable lapse. Munching into Paul’s sourdough cob was a moment of ecstasy. That first bite reminded me how nourishing and deeply satisfying good bread can be. Paul is a master baker who runs bread making classes from his bakery, Panary, located inside an old working water-mill near Shaftesbury, Dorset. His classes have been operating from this site for more than 30 years. He also bakes a commercial batch weekly. Before moving to Britain, Paul built and then ran the famous St Andrews bakery on the outskirts of Melbourne, Australia. That lovely mud brick building with its antique wood fired oven was where Paul mastered his baking skills. 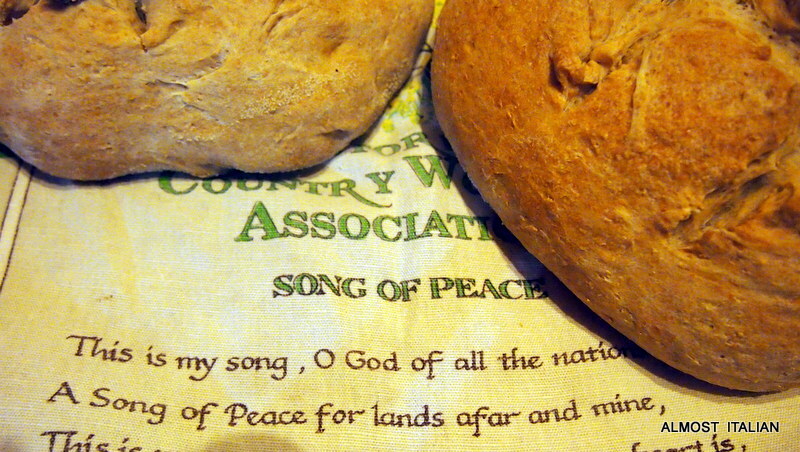 His bread nourished our souls throughout the 1980s. His bread is even better today. A familiar sight. Paul in baker’s uniform, attending to his craft. Our first sourdough loaf lasted well and was still fresh and delicious after five days. Good wholesome bread, slow bread, made with nothing else but the best organic flour, water, salt, and plenty of time, Paul’s loaves are made with exceptional skill as well as passion for the craft. Inside a working flour mill. It all starts with great flour. Paul uses this one to add to his starter or levain. Fresh flour, the staff of life. The Hand Built Finn. My Sourdough Diaries. The other day I ran out of bread. I can’t eat ‘white death’ or spongy packet bread of any colour, dosed with preservatives to make it last forever. Neither can I eat the fake sourdough marketed to look like the real thing sold in a well-known supermarket or the stuff from hot bread places. I perused the specialty bread section of the supermarket where racks of famous city bakers display their tempting loaves, Dench, Baker D Chirico, La Madre, Phillipa’s: there’s not much change from $10 for an ‘artisan’ loaf, rivalling the smashed avocado as the real cause of inner city hipster poverty. We went without bread that day. Home made Finnish Rye. Just add smashed avocados. I hurried home and hastened along my trusty starter, Sorella, another offspring of Celia’s Priscilla, a consistently reliable sourdough starter in any weather. It’s important, when baking your own loaves, to seek out variety in flavours and flour combinations. I often get stuck in a groove and make the same loaf over and over again, especially when I can make it on autopilot now. Overnight rise High Hydration loaves. Our regular loaves. 80% baker’s white, 20% wholemeal. 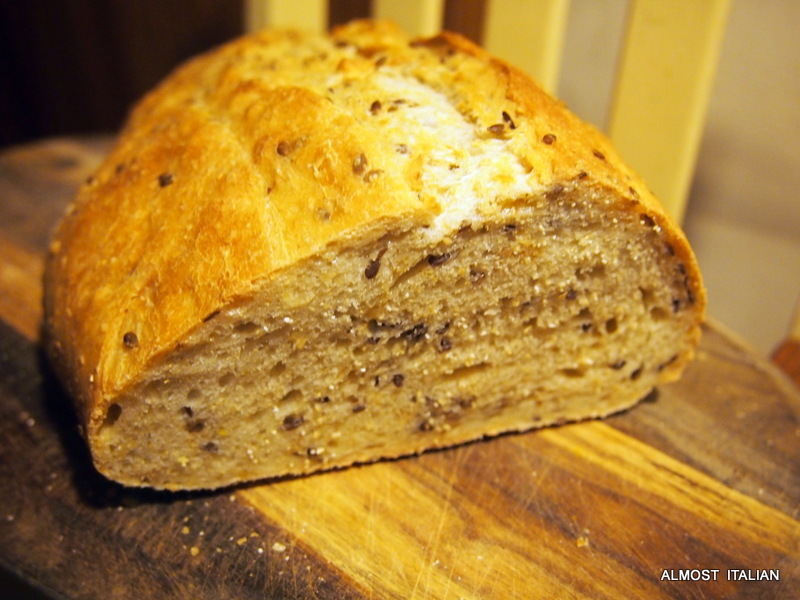 Recently I returned to the Finnish Rye loaf which I have written about before. Now that I’m hand building this loaf, thanks to the demise of my stand mixer, I’m finding it far more successful than before. For sourdough bread makers out there, I urge you to give this one a go. It stays moist for three days or more thanks to the linseed. Forget about my previous method- this one makes a superior loaf. 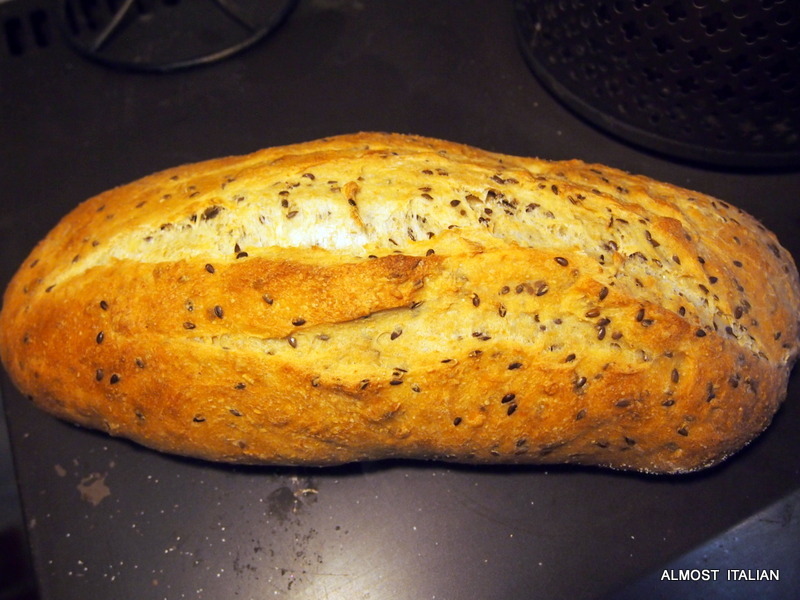 Linseed is full of omega 3, so this loaf is healthy but doesn’t taste heavy at all. It is soft, earthy and easy to digest. You could live on it. The Finnish Rye Loaf, recipe courtesy of Craig Gardiner, baker extraordinario. 173g sourdough starter (100% hydration). Make sure it has been refreshed three times and is bubbly before use. 154g water to soak flaxseed. Put the starter, water and molasses together in a large mixing bowl. Add the flours and bring the dough together by hand. Cover the dough and leave for 15 minutes. Add the salt, mix through the dough and let stand for 1 minute or so. Add the soaked flaxseed along with the soaking liquid and squelch through with your hands, making sure the liquid and all the seeds are distributed through the dough. The mixture will be very wet. 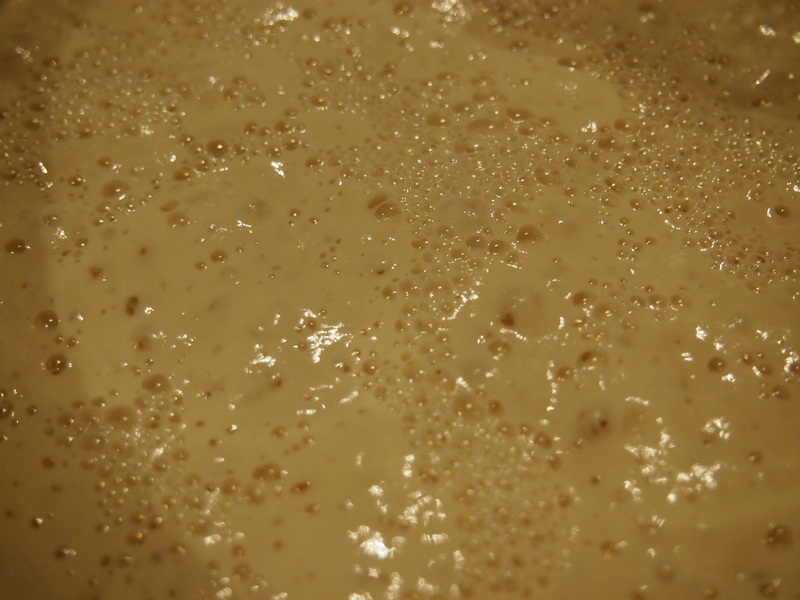 The dough will look like this after the seeds and soaking water have been mixed in. Let the dough stand for 30 minutes. 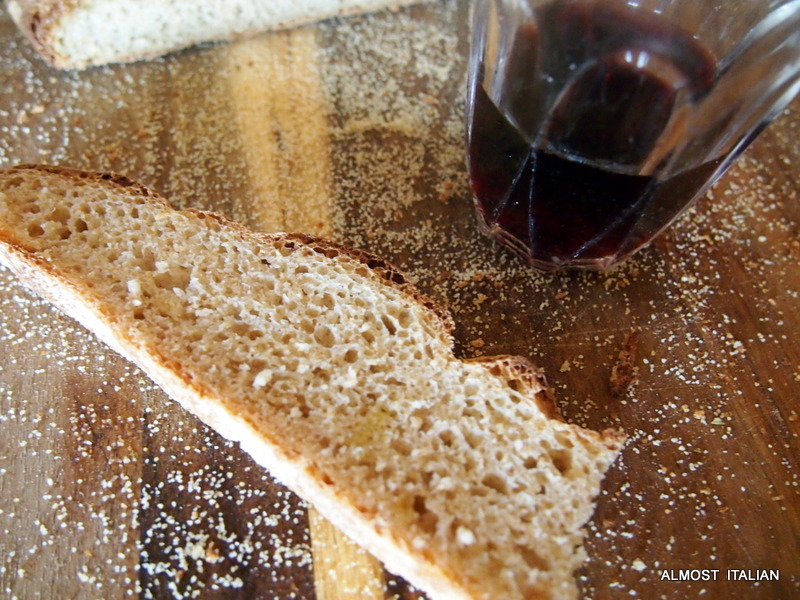 Put a few drops of oil on your bread working surface and spread out with your fingers. ( I use a silicon mat which has been a great investment). Scrape out the wet dough using a pastry scraper, then stretch and fold the dough. 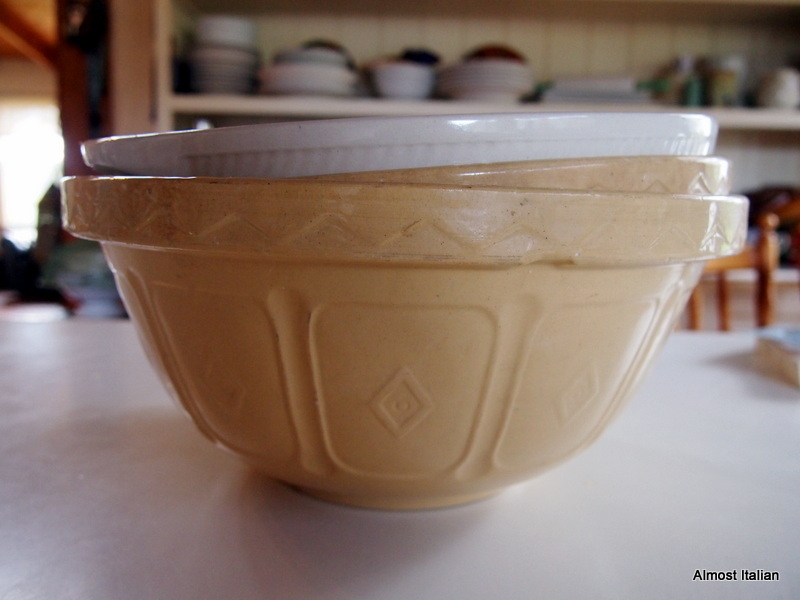 Return dough to the bowl and cover. Let the dough stand for another 20 minutes, repeat stretching and folding, returning dough to the bowl and covering. That’s four stretches in all. If you do two or three, the bread will not mind. I always have sticky hands and so have not been able to photograph this method. Where is Mr T when you need him? If you need a little visual version of this method, check Celia’s video here. You will notice the dough tightening with each new stretch. Now cover the dough and leave in a warm spot for around 4-6 hours, depending on your room temperature. Basically it needs to double in size. Don’t overprove this bread. Scrape the contents of the bowl onto a floured surface, using a pastry scraper. It will be sticky so flour your surface well. 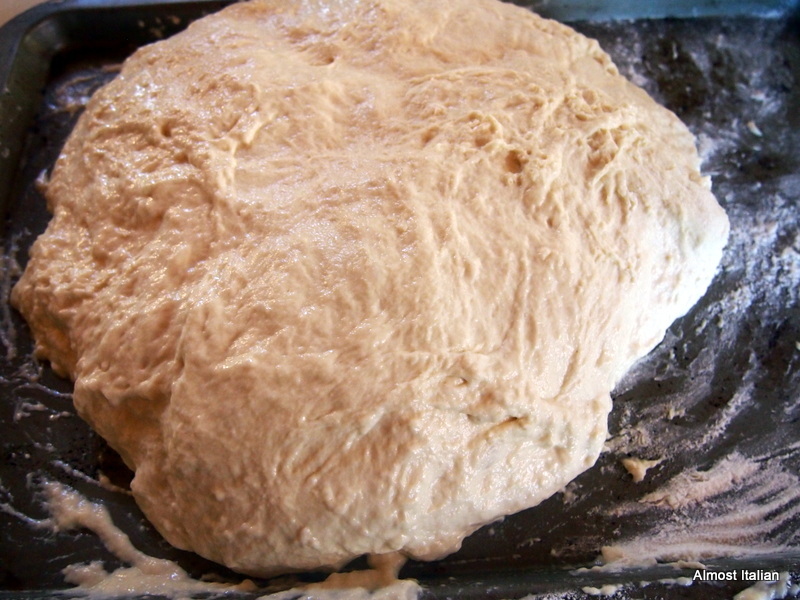 Now pull up one side of the dough and stretch it up as far you can and fold this long piece over the rest of the dough. Do this with the other side. Then top and bottom. All the surfaces will now be lightly dusted with flour and will not be so sticky. Cut the dough in half with a pastry scraper. Shape the loaves into round balls for another short prove. Cove the dough balls with a tea towel. Turn oven on to 250c Fan Forced. After 30 minutes or so, the oven should be ready and the loaves slightly risen. Now gently shape the loaves. Do not overwork them at this point. treat them like soft babies. I like to make batard shapes. 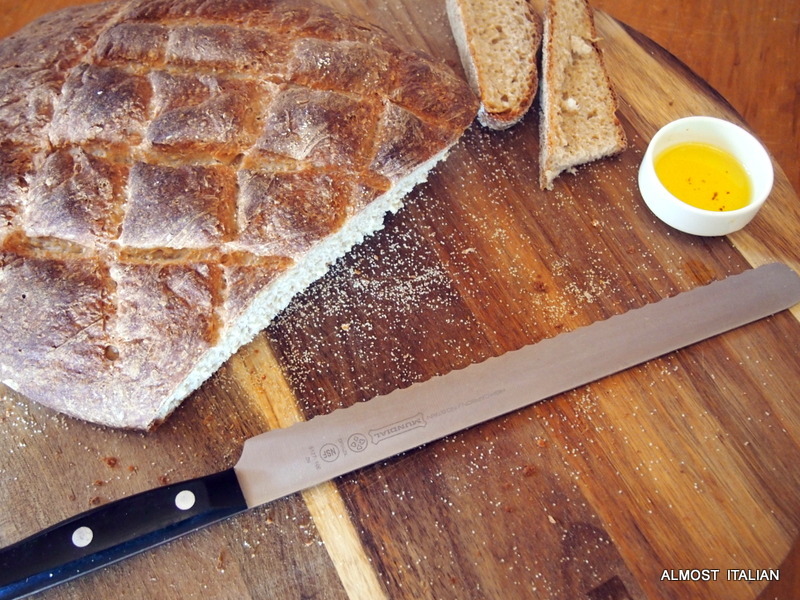 Place the loaves onto baking paper, then slash the tops well, using a serrated knife or a razor blade. Lift the paper with loaves into enamel baking tins and cover with lids. Put the two roasters into the hot oven ( if your oven is large enough to take both) reducing the temperature to 220c. Bake for 20 minutes. Remove the lids, and bake for another 15-20 minutes at the same temperature. Usually the time here is 20 minutes but these loaves are a little smaller than the usual loaf size. I am indebted to two baking mentors here- Craig for the original recipe, and Celia for the method and for the brilliant idea of using enamel bakers for a more consistent result in the home oven. The Finn, a moist loaf. Posted on October 20, 2016 October 20, 2016 Author FrancescaCategories Bread, Budget, RecipesTags artisan, baking, bread, breadmaking, budget, enamel roaster, Finnish, home bread baking, linseed, rye flour, sourdough, wholemeal27 Comments on The Hand Built Finn. My Sourdough Diaries. In My Kitchen, I am surrounded by things starting with the letter ‘B’. No, this is not an episode of Playschool or an eye spy game, although there have been a few bambini hanging out in my kitchen lately. It all happened by chance I promise you. And thanks to Celia, host of this monthly event and bread making enthusiast, I seem to have caught her bread making bug. The ceiling is beamed, the floor is brick, and there’s a Breville on the bench. Big bowls are often left standing on the bench, waiting for some more bread dough, while my starter, who lives in the fridge, (who is affectionately known as Celia), begs to be fed. The ‘Feed Me’ instructions are left on the fridge door. Bread dough. I’m slowly learning about very wet doughs and hydration. This one looks too wet, but still made a reasonable loaf of bread. Thanks to Celia’s bead making tutorials, help is close at hand. Big Bucket. 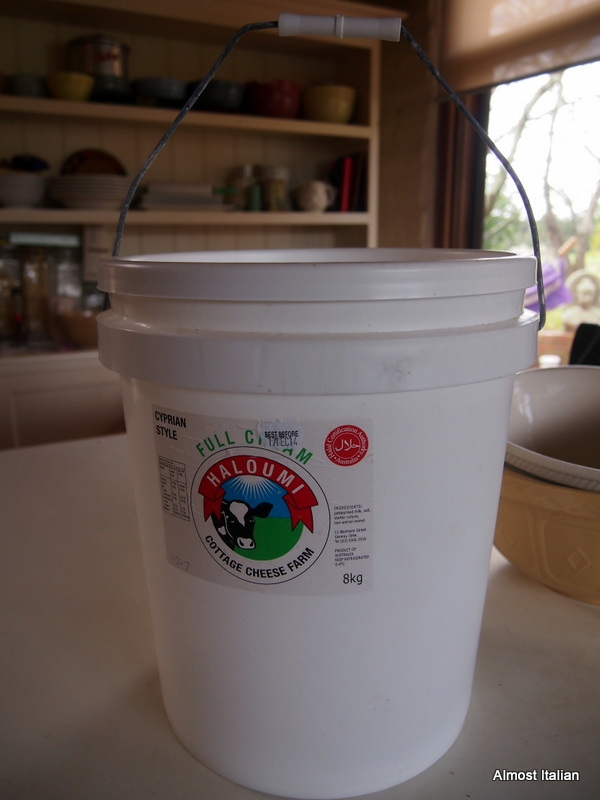 This empty plastic bucket turned up at the Whittlesea Monday market last week. I should have bought more: at $2.00 a piece, they are a steal. Large enough to store all the odd flours. The baker’s white flour has its own big bin. 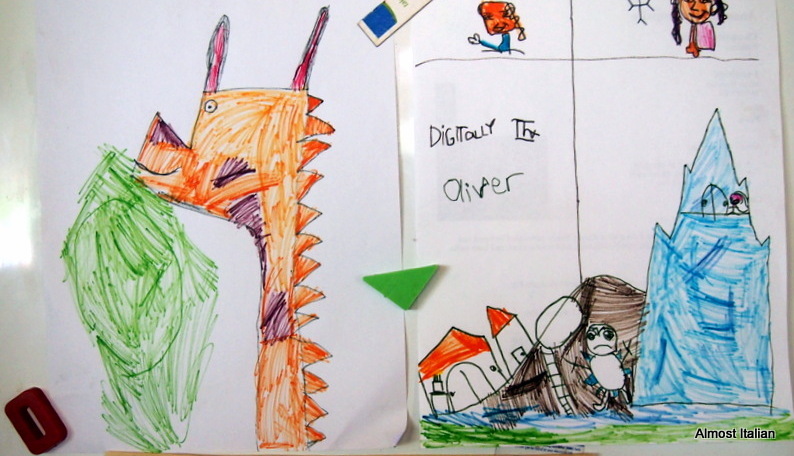 Boys Art on the fridge. This arty stage doesn’t last long, so must be embraced. Hiding their iPad helps! Blink, and they’ve turned into teenagers. Books, old and new. The four oldies were found in a second-hand store and I once owned three of them. Talk about deja vu. For under $10.00 for four, it cost the same price as a new magazine! 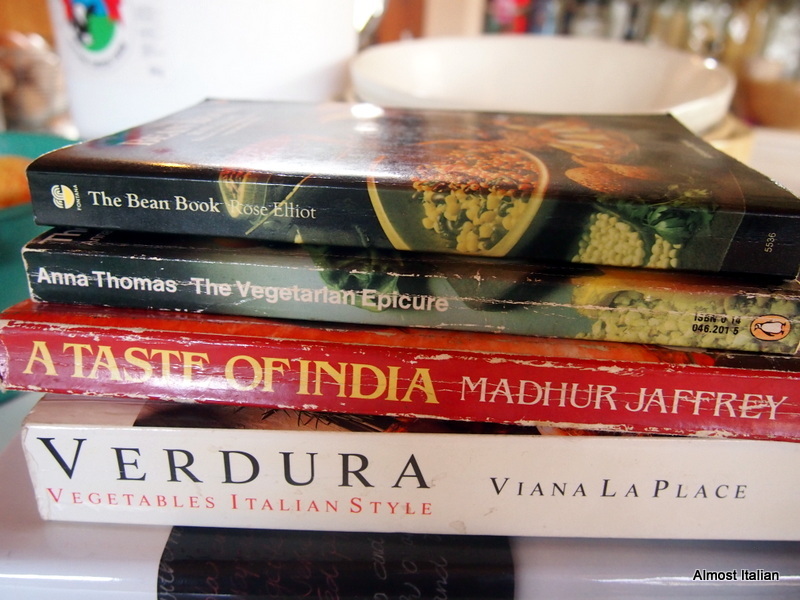 Now I am re-visiting my cooking past. 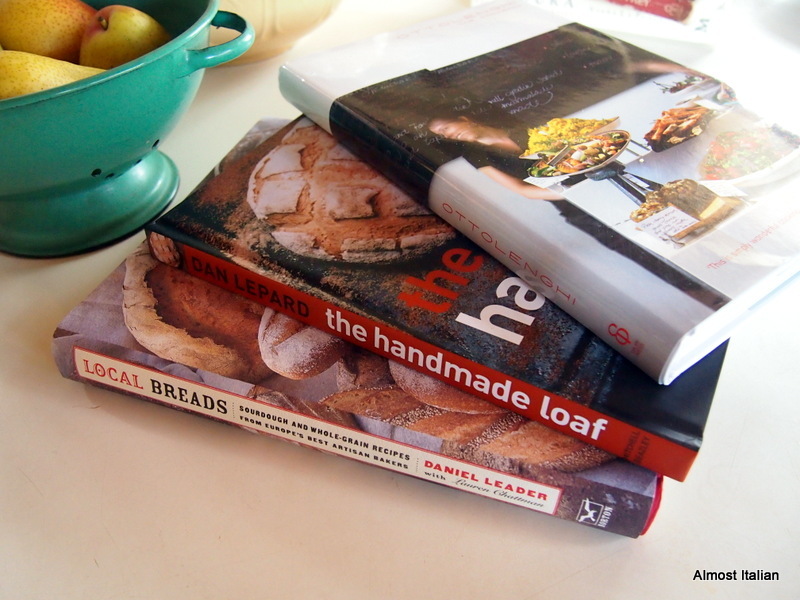 Book 1, Local breads by Daniel Leader, purchased via the excellent book buying search engine, http://booko.com.au, which sorts books for sale throughout the world, listed by lowest price first, delivered. 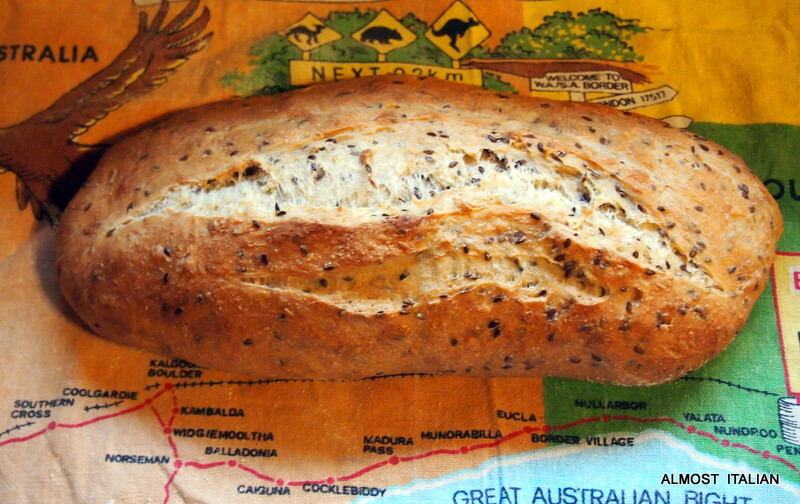 Book 2, The Handmade Loaf by Dan Lepard, bought from the Book Grocer, in Brunswick, a shop too hard to pass by. And book 3, yet another Ottolenghi cookbook bought cheaply at Big W.
Biscuits. School holidays means baking biscuits with the bambine and the little blokes. The girls made these last week and the simple recipe is here. 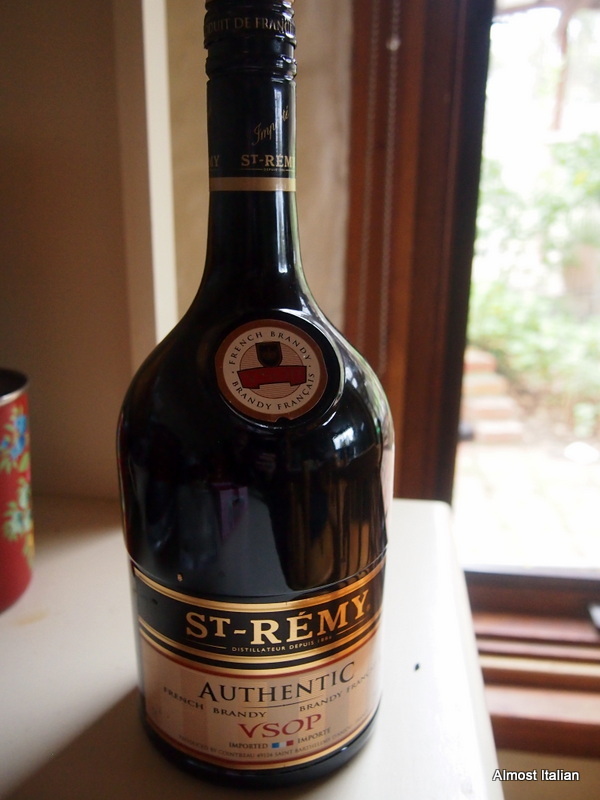 The brandy was bought duty-free. Purely for medicinal purposes. It invariably ends up in all sorts of cakes and custards and so lives in the kitchen, unlike its other friends who have their own hiding place. All the ‘B’ veggies arrive in Spring. 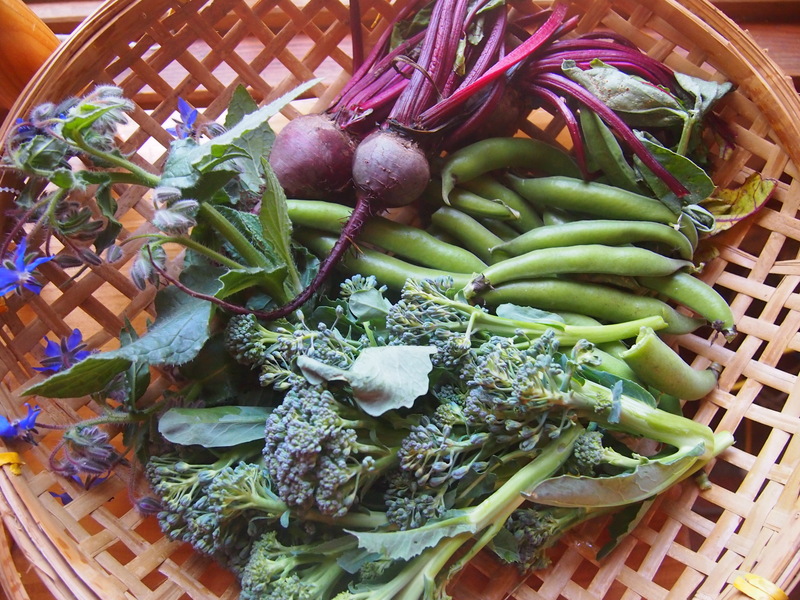 Some pickings here include beetroot, broad beans, brocolli and borage. If I include them by their Italian names, the biete ( silver beet) and the barbabietola ( rhubarb) are in abundance too. 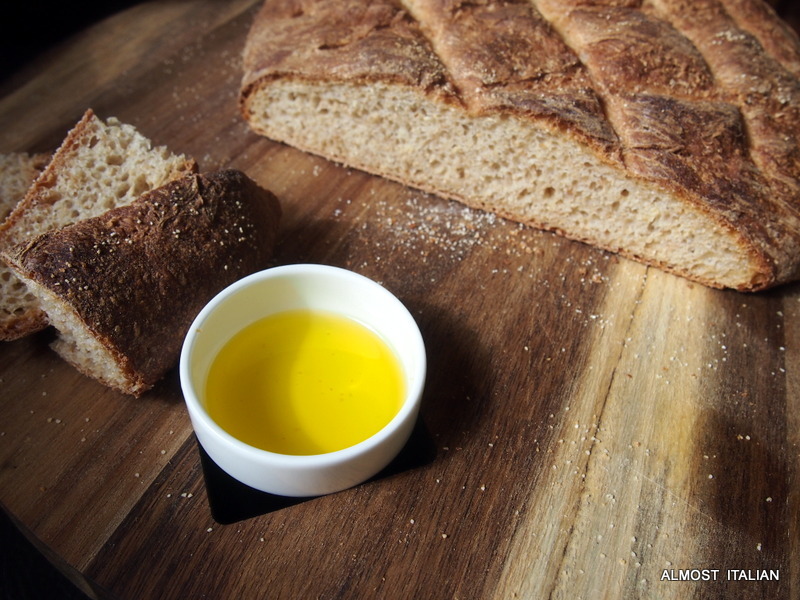 Italian bread, simply anointed with young olive oil, the best you can afford. 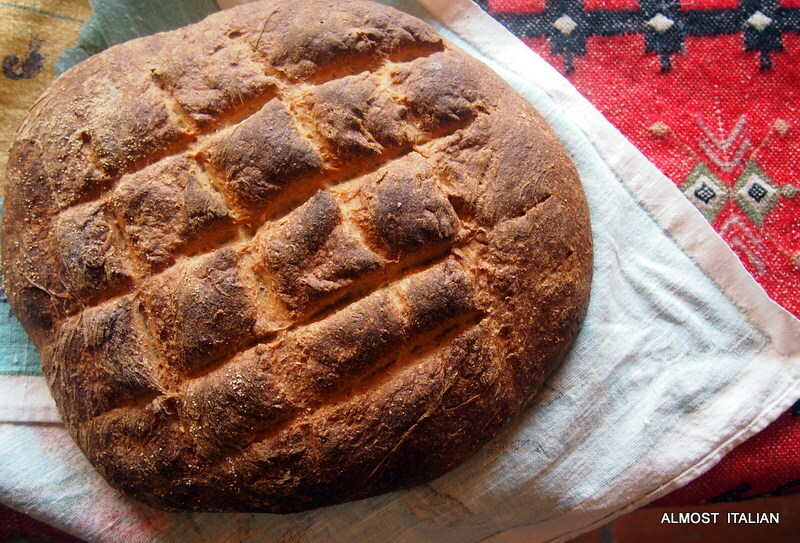 Senza il pane tutto diventa orfano– without bread, everyone becomes an orphan. 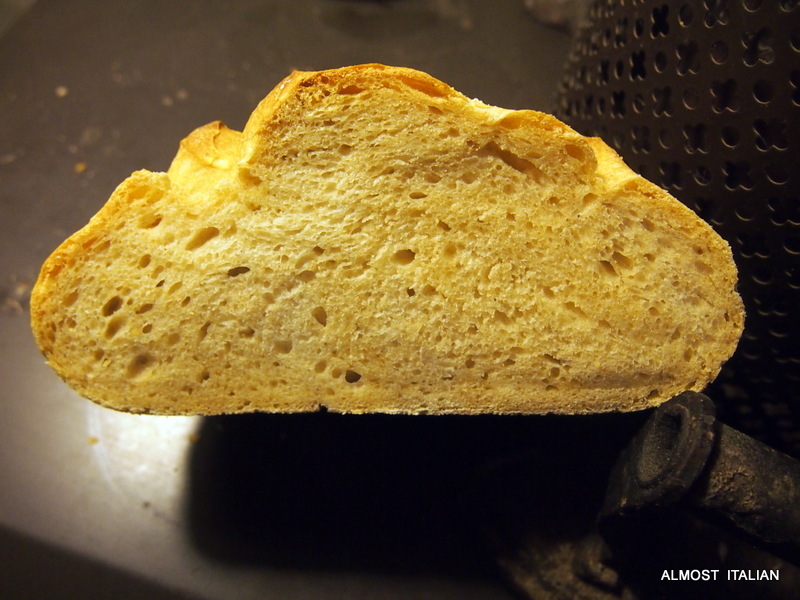 Uscire di pane duro– to leave behind hard bread or to have a change for the better. Essere pan e cacio- to be like bread and cheese, ie thick as thieves. churigo come il pane, medico come il vino. Look for a surgeon who is like bread ( ie young) and a doctor like wine ( ie old). E’ buono come un pezzo di pane. He’ s like bread, He’s a good person. pane al pane e vino al vino , to call a spade a spade. But wait there’s more. I’ll spare you the rest. My most recent loaf, a wholesome, nutty Pane Integrale con Miele ( wholemeal with honey) reminds me of a crusty loaf I bought years ago in a small Umbrian hill town. The crust is crunchy and dark, but not too much so, and the open textured bread is easy to digest, which is surprising for a loaf made of 100% wholemeal flour. I’ll admit that when it first emerged from the oven, I was a little concerned. Nothing worse than pane duro, hard bread. 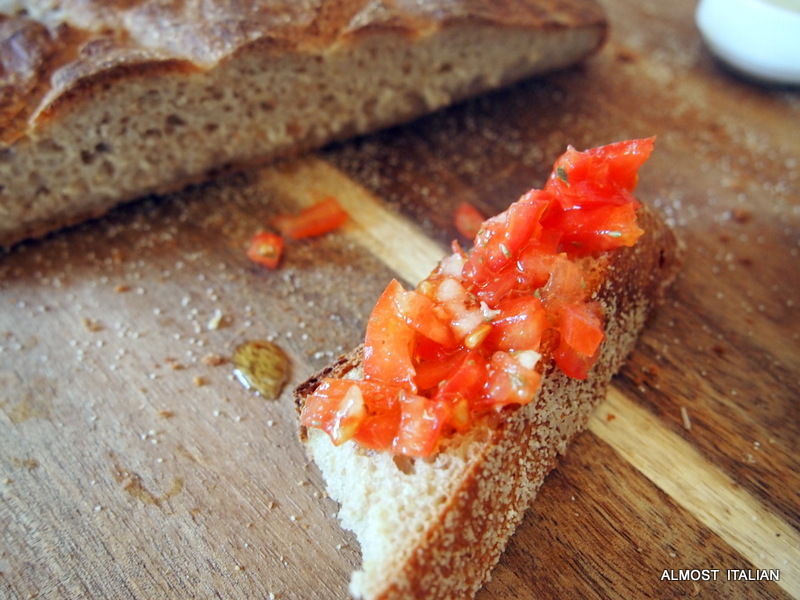 With tomatoes, garlic, and oregano, a simple bruschetta. The secret is the long slow rising ‘biga’ or starter, made especially for this loaf, and the addition of honey. The recipe comes from my favourite cookbook, The Italian Baker, by Carol Field, and I offer this bread recipe to Leah, of the Cookbook Guru as further proof of this book’s worth. 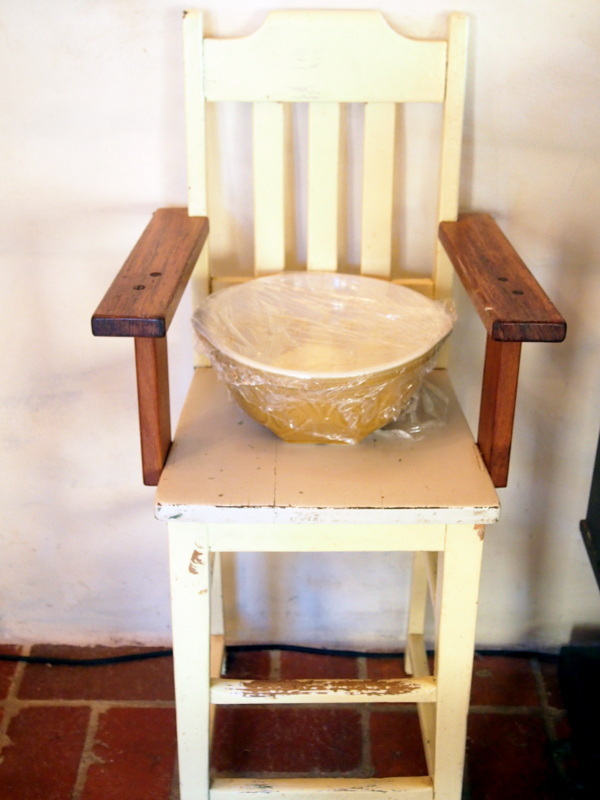 Stir the yeast and honey into the water in a mixer bow: let stand for about 10 minutes. Break up the starter and add to the bowl. Stir with the paddle until the stater is in shreds. Add the flour and salt and mix until the dough comes together. Change to a dough hook and knead for 2 minutes at low speed and 2 minutes at medium speed. 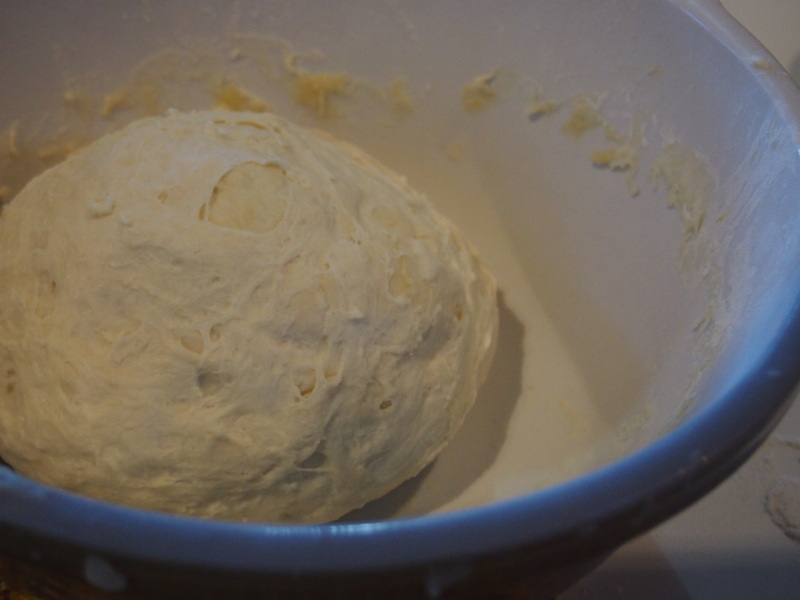 The dough should be fairly smooth and have lost most of its stickiness. Finish kneading by hand on a floured board. First Rise. 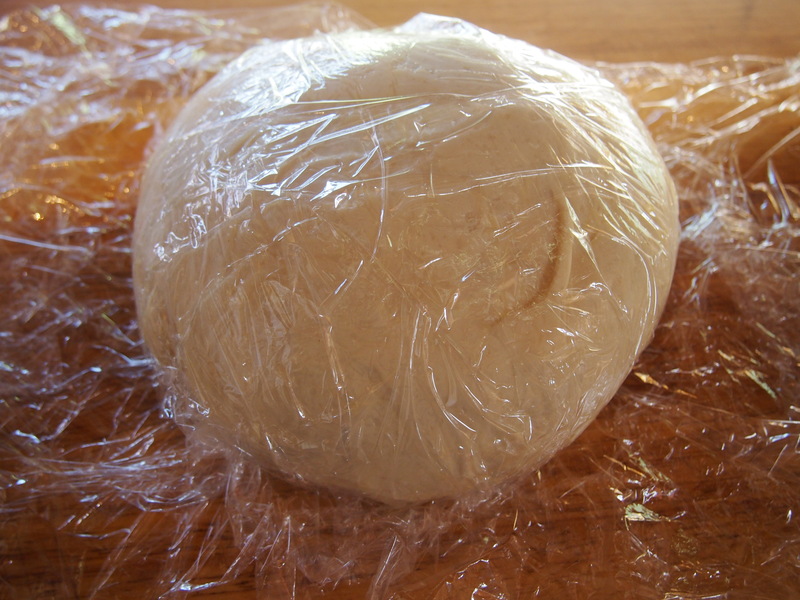 Place the dough in a large oiled bowl, cover tightly with plastic wrap, and let rise for about 2 hours or until doubled. Shaping and second rise. 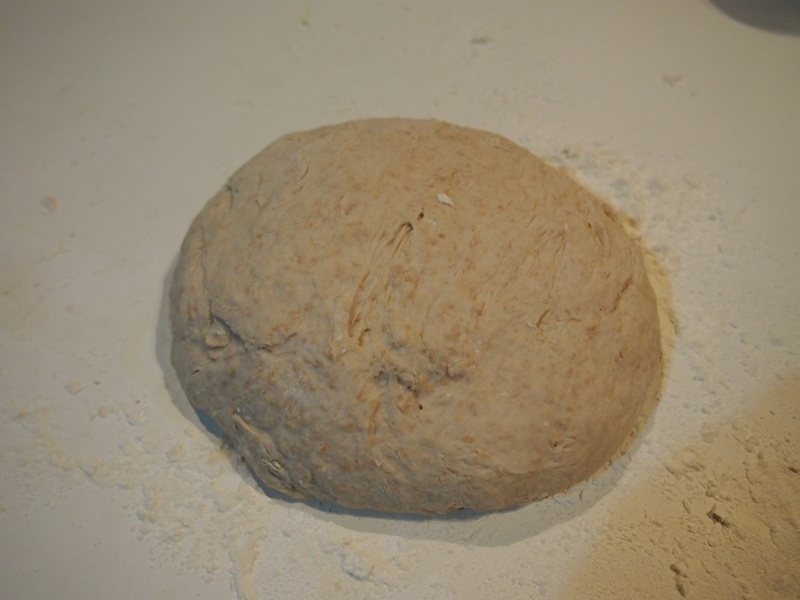 Turn the dough onto a well floured surface and shape into a round loaf without punching the dough down. Place the loaf on a slightly oiled baking sheet or a peel sprinkled with cornmeal . Cover with waxed paper or a towel and cover with plastic wrap. Let rise until doubled, around 45 minutes to one hour. Baking. Preheat oven to 230 c/450 F. Bake for 10 minutes, spraying the oven three times with water. Reduce the temperature to 200c/400F and bake 25 minutes longer. Cool completely on rack. My notes. 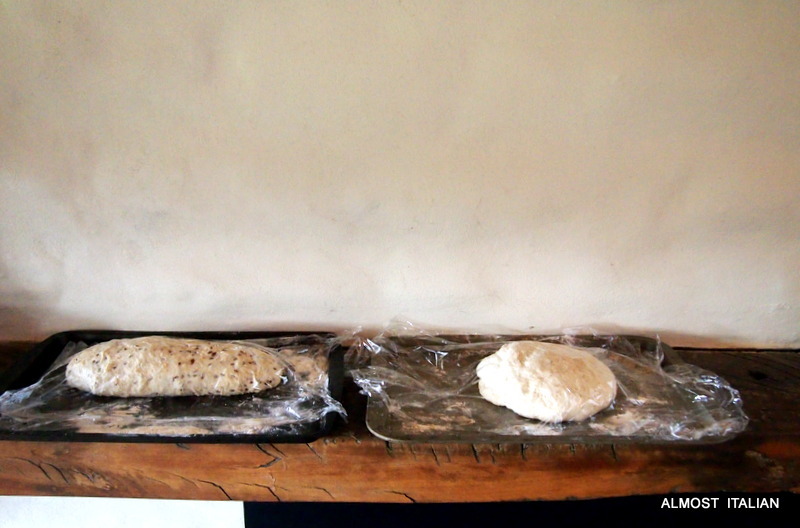 My dough spread quite widely and looked like a cartwheel loaf one buys in Italy. I slashed the top of mine in a tic-tac-toe pattern, causing some deflation before it entered the oven: next time, no slashing to see what happens. I used course semolina on the trays. No need to waste the left over biga – use it in another loaf while the oven is hot. The book also gives instructions for making the loaf by hand or with a food processor. I have listed the method by kitchen stand mixer only. A workman’s lunch. Pane e Vino. Sourdough Diaries. Flaxseed and Oats. Over the last year, the St Andrews Bakery was blessed with a gifted baker. His Finnish flaxseed rye sourdough loaf was ‘to die for’. I would buy a few loaves to freeze each week and was surprised how moist they remained once sliced open. He had studied bread making at the San Francisco Baking Institute and worked in that fine town for 12 years, before returning to Melbourne, and then to the famous authentic wood fired bakery of St Andrews. He left around last March, to pursue other fields or bakeries, and now I am left with a gaping need for his flaxseed sourdough bread. Come back here young man! 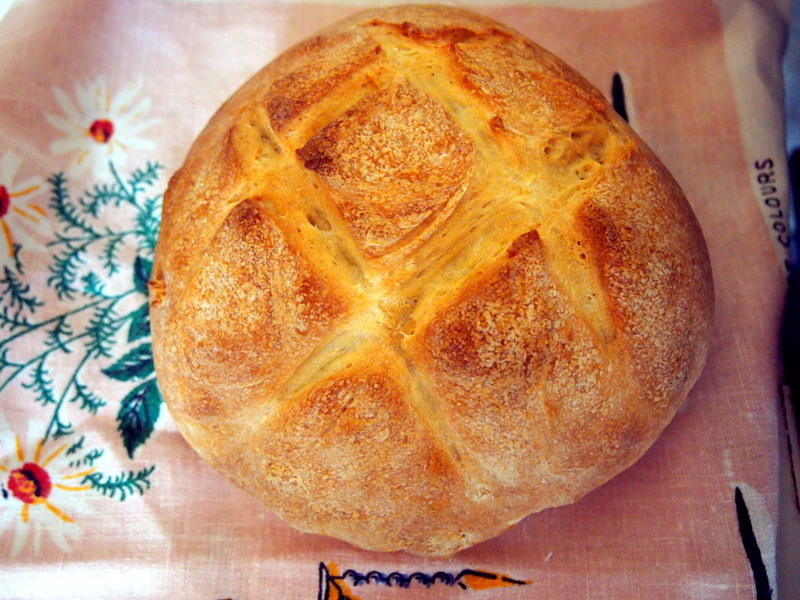 Enter Celia to the rescue with her excellent tutorials on sourdough bread making. After reading various articles about flaxseed ( linseed) I decided to incorporate it into a basic sourdough loaf with 30% wholemeal and 70% baker’s white flours. Prepare the starter one day before baking in the usual way as described by Celia. with just enough water to cover. Mix roughly to combine, then add the soaked ingredients and mix again with your hands. Proceed with Celia’s instructions re short kneading, proving, shaping, second proving and baking. Another proving station on the mantelpiece. Notes. 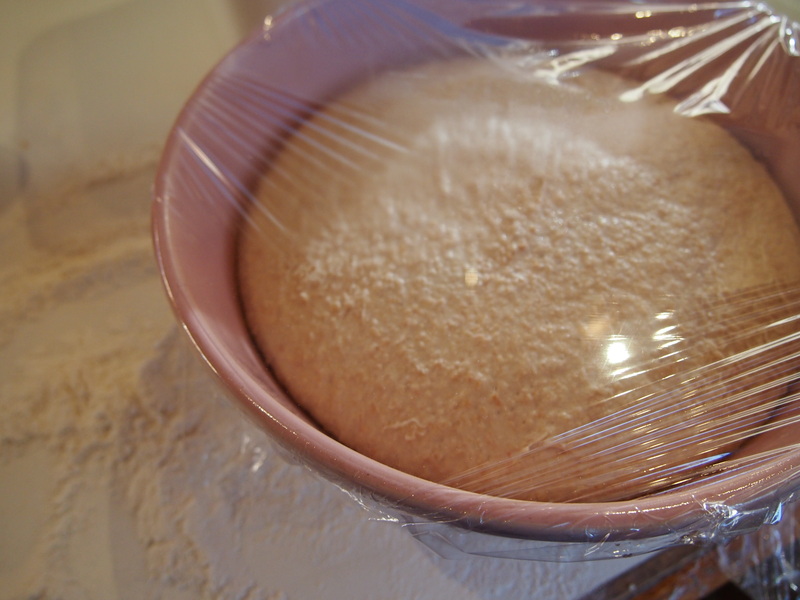 If the dough is a little moist at the first kneading stage, add a bit more flour to the mix. Only your hands can tell. Verdict. Very tasty, my favourite to date. Still eating well two days after. Next time, the same recipe but with rye flour and more flax seeds. Or maybe I’ll try ground flax seed as well. Posted on August 17, 2014 August 17, 2014 Author FrancescaCategories Bread, RecipesTags baking, breadmaking, flaxseed, sourdough, St Andrews Victoria20 Comments on Sourdough Diaries. Flaxseed and Oats. Sourdough Diaries. Wholemeal and Spelt. It’s 6 degrees outside and Kevin Bacon springs to mind! An odd thought to start the day, I know. 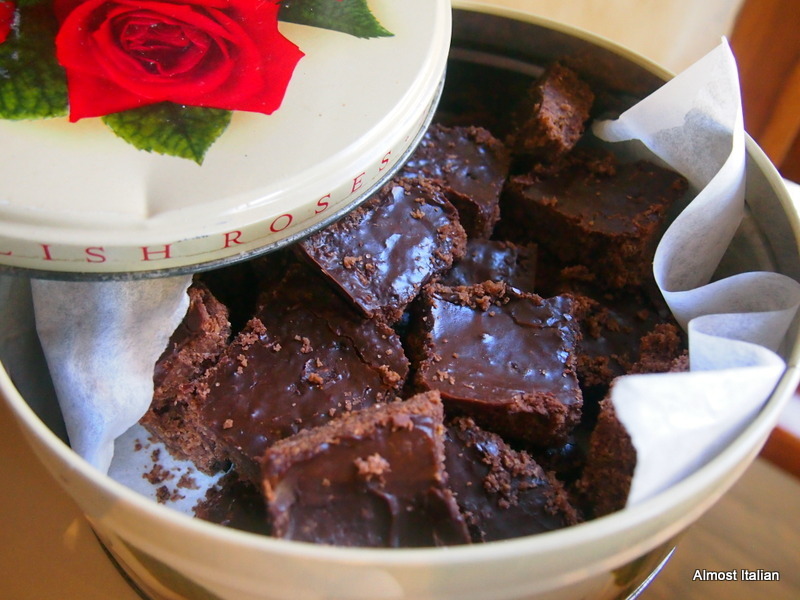 Any plans to garden or gather plants have been shelved in favour of baking. I am experiencing separation anxiety from my lonely sourdough starter waiting for me at the back of the fridge. Time to light the fires and get ‘Celia’ into action. Last week I made three different loaves using the basic foolproof tutorial provided by Fig Jam and Lime Cordial. My first loaf was white and gorgeous. Loaf number two was more appealing, made with half baker’s white flour and half wholemeal flour. The third started as pizza dough, but as time ran out in the evening and the dough wasn’t fully risen, it became the next day’s spelt and white sourdough loaf. The latter contained a mixture of 20% spelt flour to 80% white baker’s flour. I am keen to increase the spelt content on this one. The young visiting lads enjoyed the spelt loaf, eating all the crust, a good sign, and asking for more. This is the best compliment a bread can have. It is now two days old and while a little firm, is excellent grilled for bruschetta. Now I am in search of some decent large packets of rye flour in Melbourne. I found a large bag of Rye flour at Bas foods, Brunswick, but it contained added salt, sugar and oil and appeared to be a bread mix. The health food shops tend to pack things in tiny quantities and charge an arm and a leg. Any hints anyone? 20% spelt adds a nutty flavour. Posted on August 10, 2014 August 11, 2014 Author FrancescaCategories Bread, Budget, RecipesTags Bas foods, breadmaking, Brunswick 3056, Celia, sourdough, spelt21 Comments on Sourdough Diaries. Wholemeal and Spelt. The Secret Life of Celia, my Sourdough Starter. Celia is the name of my sourdough starter. She is the daughter of Priscilla, the sourdough starter sent to me by Celia, of Fig Jam and Lime Cordial. Some readers may already know the real Celia, baker extraordinaire and all round generous and inspiring woman. Her online tutorials are easy to follow, thorough and are well supported with photos at every stage of the process. In fact there are around 367 bread making related posts on her site, as well as further information on bread making supplies and equipment. This, I believe, is a far better guide than any bread making book and a wonderful thing. 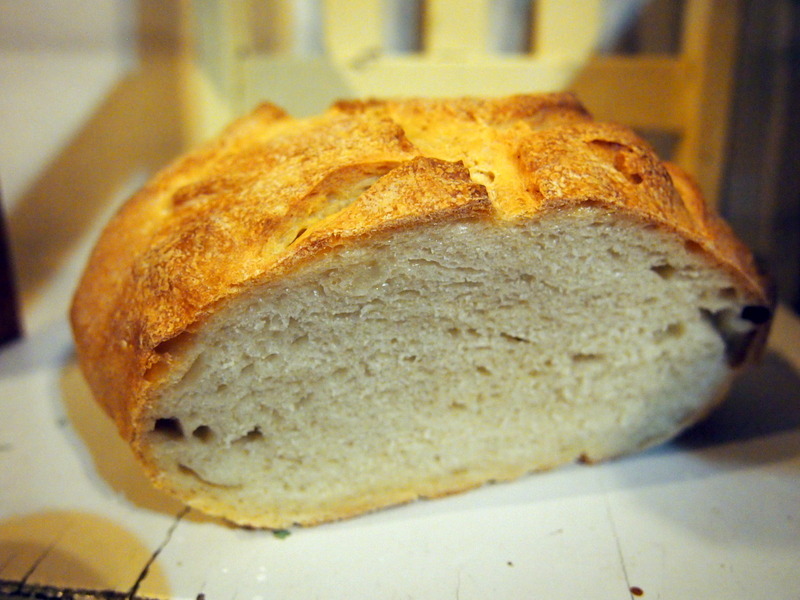 The following post is a test case diary of my first sourdough loaf. 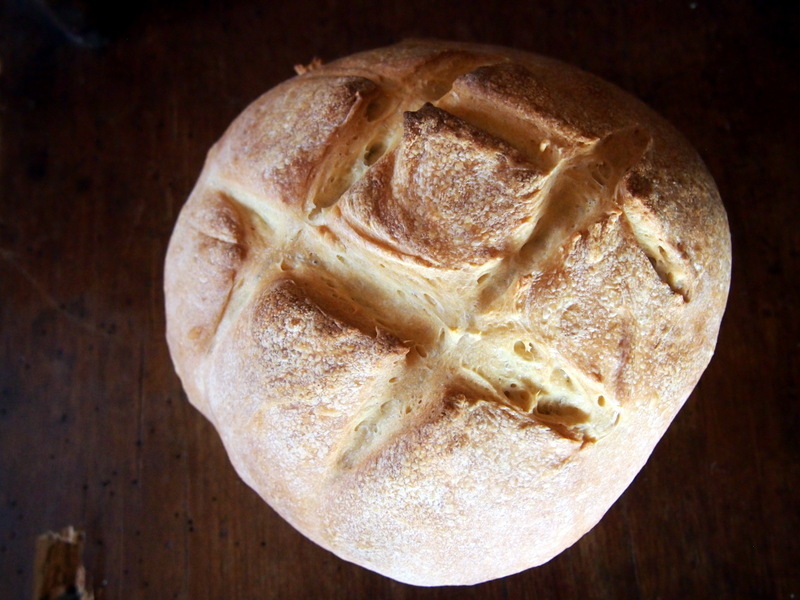 If you wish to make sourdough bread too, just head straight to Celia’s instructive post here . and bubbly. Hooray. After incorporating the remaining bread ingredients and a pause of half an hour, the dough was very easy to knead. Then off she went to happily sit in a winter sunny spot on my ‘proving’ high chair. Hand made Australian high chair becomes a proving station. The dough proved for around four hours (winter in a warm room) and then looked ready to rock and roll. The second proving was a little harder to judge. The loaf was slashed, spritzed and baked as instructed. It came out looking great and once cool, we hoovered a few slices with plain butter. It smelt and tasted very good. I may have erred somewhere as it sounded quite drum like when first removed, but the base sounded a little softer on cooling, yet it didn’t really affect the flavour or texture. Cost for a quality sourdough loaf retail – around $7.00. The cost would reduce to 95 cents per loaf, if two were made at once, as well as saving power. Next time I will make two and freeze the spare. Thanks to Celia, the mentor who inspired this post. Just click on Bread at the top of her home page to find out more. 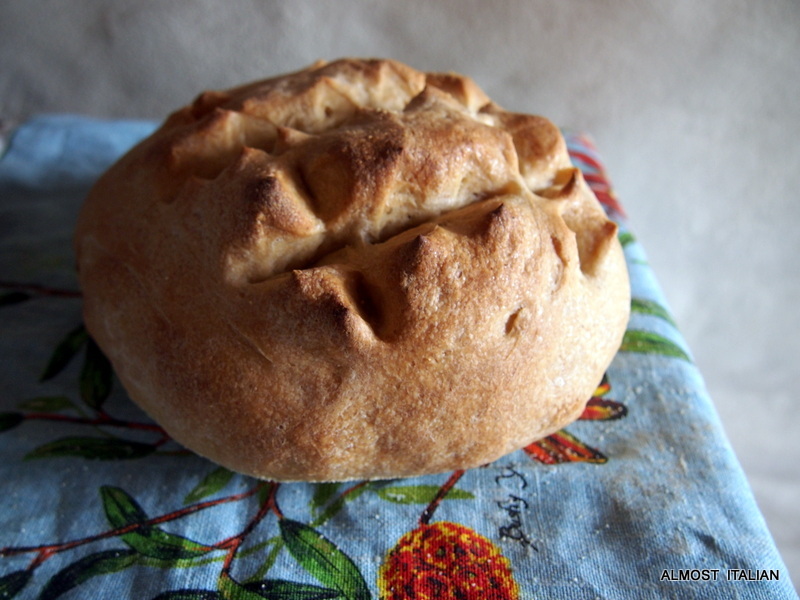 Posted on July 31, 2014 August 17, 2014 Author FrancescaCategories Bread, Budget, RecipesTags breadmaking, sourdough23 Comments on The Secret Life of Celia, my Sourdough Starter.